Over 70 acres of free, lighted parking with people movers to deliver you to the main entrance gate on Seaman Street. Parking areas can be entered from Starr Avenue, Corduroy Road or Seaman Street. People movers operate continuously in a 27 acre parking area accessible from Seaman Road or Corduroy Road. 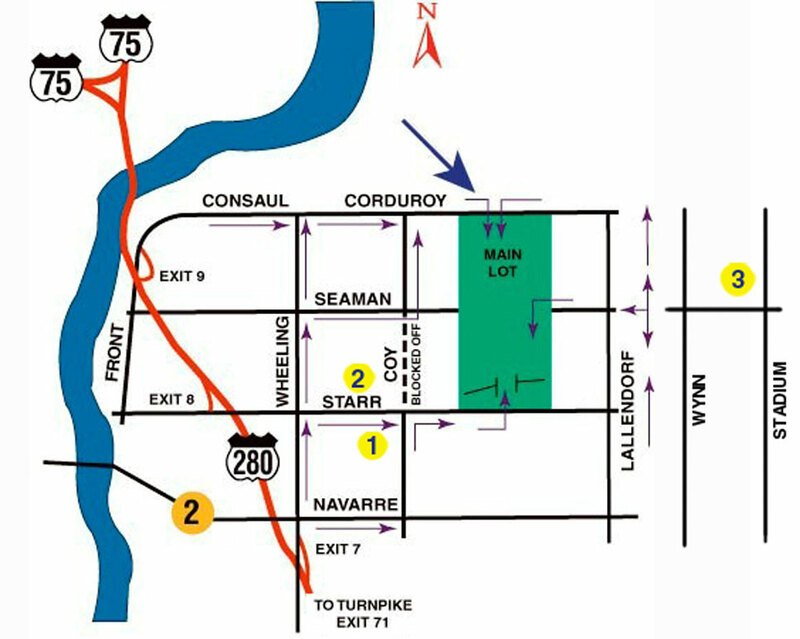 Other entrance gates are accessible from Starr or Seaman lots. Handicapped parking available: Cars with handicapped stickers should park in the designated "Handicapped Parking" area directly in front of the Festival grounds on Seaman Road. Shuttle bus service from three Toledo-area parking lots deliver you right to the gate and safely return you to your car. Rain or shine parking at Starr Elementary School, Fassett Middle School and Clay High School lots (East Lot) with shuttle bus service between these lots and the Festival grounds.